My Kentucky-born grandmother was the queen (in my book) of making the most magnificent biscuits and "white pepper gravy" loaded with chunks of browned breakfast sausage. 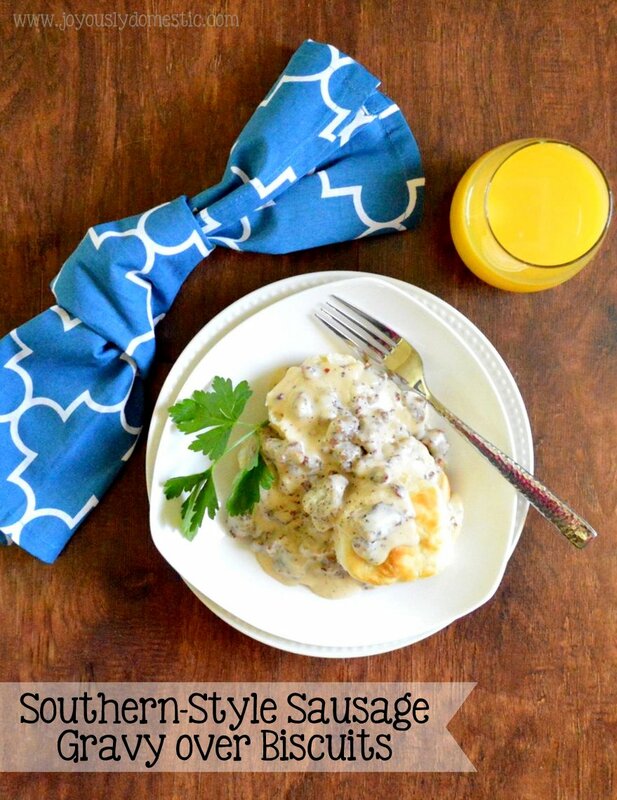 Weekend breakfasts of Sausage Gravy and Biscuits were a staple in my childhood. I am always leery ordering the same when I am dining out because there is rarely an occasion when the gravy comes close to measuring up to my grandmother's version. So, I make it often at home. I wasn't lucky enough to have my grandma's recipe written down ... and frankly, I highly doubt she ever had or followed an actual recipe. But, I did spend years by her side watching and helping her prepare this dish. And, after many years of tweaking and perfecting the recipe as an adult myself, I think I now come close to what was served to me as a child. I want to mention that the purpose of this post is to share with you my gravy recipe - not a biscuit recipe. Being honest, I often cheat and purchase frozen biscuits that simply need baked off in the oven. However, when I do take the time to make biscuits from scratch, I almost always use Alton Brown's Southern Biscuits recipe. I've found the recipe to be the best for yielding ultra-soft, tender, fluffy biscuits that most resemble my grandmother's. In a large skillet set over medium heat, begin cooking sausage. Break sausage up using a large spoon or rubber spatula. Cook - stirring occasionally - until crumbles begin to brown nicely and just start to crisp around the edges. Sprinkle in red pepper flakes, garlic powder and sage. Stir and cook another minute. Leaving grease and sausage in skillet, sprinkle in flour. Stir to coat sausage and cook while occasionally stirring for 1 - 2 minutes. (Do not allow flour paste to brown.) Gently stir in milk (begin by using 2 cups, but reserve the remaining 1/2 cup if needed) - a little at a time - until well-combined and no lumps remain. Simmer until gravy thickens - stirring as necessary to ensure gravy does not stick or burn. Taste and adjust seasoning as necessary just prior to serving. Serve over biscuits that have been split in half and buttered. I loved my Grandmas biscuits and gravy too! She never used a recipe either. She was from Western Tennessee and never put sausage in hers. Just seasoned the milk gravy with bacon or pork salt fat. Don't know is this was a regional thing or just preference but its the only way I like it. My husband does not agree with me but is gracious enough it sausage free at home. I'll take "white gravy" any way I can get it, Pam. :) I enjoy it without the sausage, too ... but, you're right - bacon grease has to be in it when not using sausage. And just like my grandmother, I almost always have a container of bacon grease in my kitchen. Thanks for sharing. Blessings!